This subject has scope for many different interpretations, but I eventually opted to focus on an “unofficial” entrance – something which could be used to sneak into somewhere unseen. With that in mind, my naughty side immediately thought of a broken fence (misspent childhood!). My next big decision then would be what the entrance would lead into, and I toyed with a couple of ideas, but again my childhood, with happy beach-day memories, came to the rescue. The most important element of the piece for me was the fence, which I constructed from silk paper made from cocoon strippings. This gave the texture and colour required with the added advantage that it does not fray, so can be cut and applied as a single piece. The sand dunes are made from dyed velvet and the sand is toning dyed fabric enhanced with Inktense pencils. The sand is machine stitched at the entrance and both sand and dunes are hand stitched to add the details. The sky is commercial fabric and the sea is dyed cotton, again enhances with Inktense pencils. 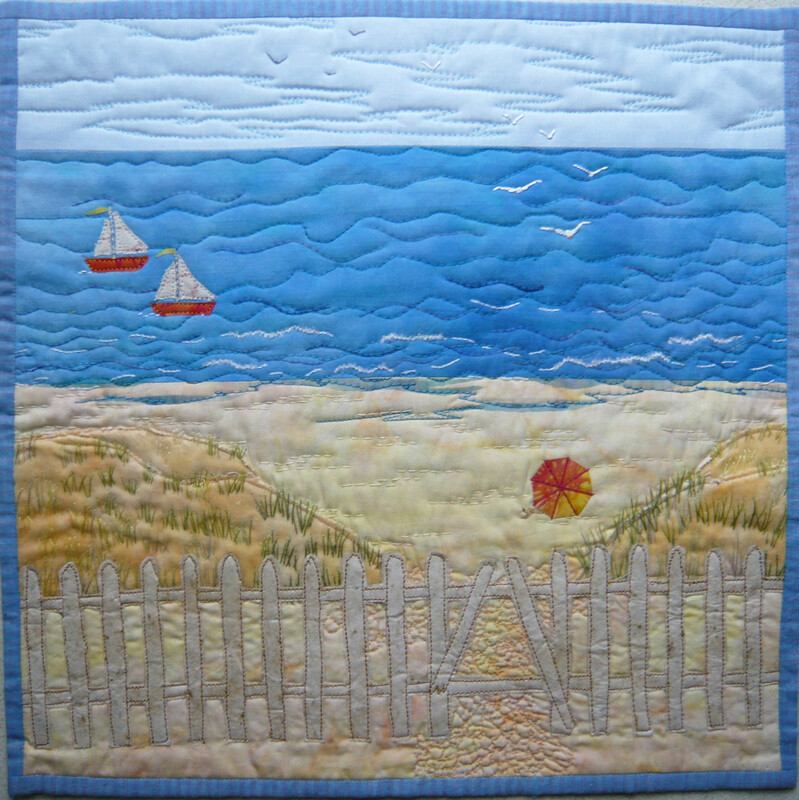 Both are machine quilted, and the sea is further enhanced with hand stitching and couching. The final details of birds, boats and beach umbrella are added to give focus and interest to the the finished piece. I was sceptical about presenting such a naïve design for this challenge, but have been convinced to do so by my long-suffering husband, who is pleasantly surprised to find that he can tell what the picture is (instead of the normal cry of “yes – but what is it supposed to be”). You can’t please all of the people all of the time, but at least I’ve pleased someone this time! I think it’s simply delightful! I believe art should bring a smile, a tear, a memory…touch someone in some way, and sometimes it takes a more ‘naive’ approach to do just that. Thank you! I like the atmosphere , and yes it brought a smile on my face too ! I love the tranquility of this piece. I Like the use of different fabrics, like you used velvet. The quilted path to the beach is lovely. So is the beach umbrella. This piece looks so peaceful and relaxed. Summer really radiates from it. 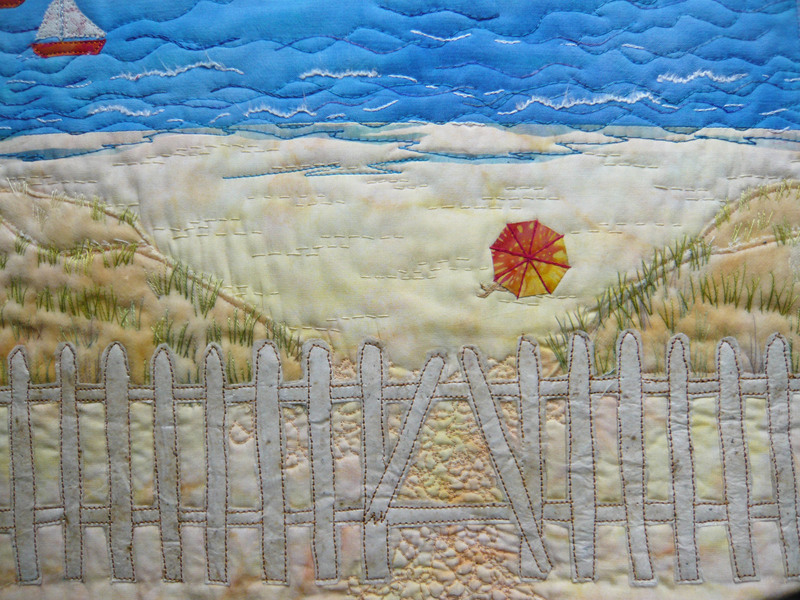 Well, I certainly find this quilt very pleasing and my eyes were drawn to the gap in the fence. I can just imagine as a child that I would have headed through the hole in the fence. This could be a beach scene close to our home. I can relate to your husband’s comments – I get similar ones from my husband at times..